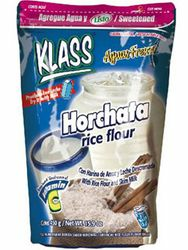 Instant Horchata drink with rice, cinnamon and sugar, made with rice flour and skim milk. (pronounced or-CHAT-ah). Horchata is a good source of vitamin C.
La Horchata ya endulzada esta lista para tomar, solo tienes que agregar agua. Yummy as always. What I normally buy in Horchata mixes. This is the best Horchata mix. It has a better taste than most restaurants. It's not quite as awesome as I remember, but as far as mixes go, this is amazing! It can be a little grainy, so you have to keep stirring as you drink. That's my only complaint. I'm used to the made from scratch kind since I grew up drinking it, however I'm too lazy to make it myself. This is a wonderful tasty quick substitute, even better than some I've had at restaurants. Doesn't need sugar (well atleast for our taste). Love it.